Stress loading refers to a specific set of exercises that is scrubbing and carrying; intended to improve the clinical course of patients who suffer from reflex sympathetic dystrophy. The program has been adapted from H. Kirk Watson and Lois Carlson: Treatment of reflex sympathetic dystrophy of the hand with an active stress loading program, J Hand Surg 1987;12A:779-785. This program may be incorporated into the treatment of any patient with a mechanically stable hand whose condition is clearly more painful and swollen than the average patient after surgery or trauma. Stress Loading consists of two principles: scrubbing and carrying. A stress loading program promotes active movement and compression of the affected joints for a minimum of 3-5 consecutive minutes, three or more times each day. Though stress loading may initially produce an increase in pain or swelling of the extremity, after several days a decrease in symptoms will begin to be evident. Use of the affected extremity in daily tasks is encouraged throughout rehabilitation to inhibit muscle guarding and disuse atrophy. Due to abnormal pain processing the patient feels unbearable pain and hence there is disuse of the part which is painful and/or if the full body is affected the person suffering becomes inactive and hence disuse comes up. In order to prevent that and regain normal range of movement and flexibility this technique is designed and progressed according to stages of recovery. Scrubbing - It consists of moving the affected extremity in a back/forth motion while weight bearing through the extremity. The patient scrubs against a hard surface, keeping the bristles of the brush in constant contact with the surface, while maintaining constant pressure on the brush. The amount of weight placed through the affected extremity and the duration of the activity are gradually increased. Scrubbing is performed with the patient in quadruped for upper extremity involvement and in elevated sitting or standing for lower extremity involvement. For upper extremity involvement, the patient holds a scrub brush with the affected hand. For lower extremity involvement, a long Velcro® strap can assist in fastening the brush to the bottom of the affected foot. Modifications can be made to enhance performance or compliance. For example, upper extremity scrubbing may be done standing at a table or counter. Persons with limited wrist extension may benefit from using a handled brush. 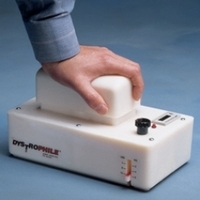 The Dystrophile® can be used to gauge reliable performance. It is a device designed to facilitate consistent weight bearing and compliance during scrubbing by activating a light when the patient has reached the preset load. Ideal for treating reflex sympathetic dystrophy/complex regional pain syndrome. To begin exercise, push down on the Dystrophile® handle while sweeping the device in any direction. Feedback light and timer are activated when the preset resistance and duration level is reached. Force can be graded up to 12 lbs. (5.4kg). Timer records in hundredths of a minute as long as the pre-set load level is maintained. Includes instructions, program guidelines, progress record sheet, and one 9-volt battery. Special, plastic-coated [email protected] Pad is used as a sliding surface for the [email protected] Device. Carrying or loading - This is the second component in the stress loading protocol. Small objects are carried in the hand on the affected side, progressing to a handled bag loaded with increasingly heavier weight. Carrying should be performed throughout the day, whenever the patient is standing or walking. The lower extremity can be loaded in a variety of ways. Walking is an important loading technique if care is taken to ensure weight bearing through the affected leg during gait, especially when an assistive device is used. Increased weight bearing can be accomplished with verbal/ physical cueing or by having the patient carry a weighted object or bag on the affected side. Loading can also be facilitated by engaging the patient in activities that promote weight shifting and balance (i.e. ball toss) or by placing the non-affected foot onto a small footstool during static standing tasks. H. Kirk Watson and Lois Carlson: Treatment of reflex sympathetic dystrophy of the hand with an active stress loading program, J Hand Surg 1987;12A:779-785. ↑ Phillips ME. OT treatment for complex regional pain syndrome. OT Practt August 20, 2001.